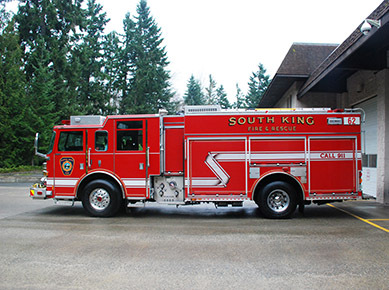 Pacific Power Group is proud to be a long-time service partner of the South King Fire & Rescue. The district protects nearly 150,000 citizens across 41 square miles in the southern King County area. We are the primary service provider for the district’s Detroit Diesel-powered fire trucks and Allison Transmissions. Our factory-certified service team has significant experience servicing fire trucks and emergency vehicles, and South King Fire and Rescue depends on our team’s ability to provide expert service and rapid turn time to get their trucks back out on the road. Recently, our Kent On Highway team provided differential service and replaced wheel bearings, seals, steering box and steering pump on one of the district’s front line trucks. With swift and knowledgeable service from our On Highway team, the truck was able to get back to its critical mission quickly.